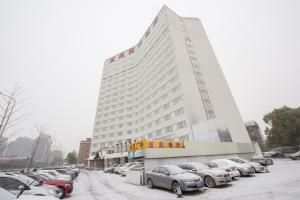 Tianan Rega Hotel Beijing is located in Dongcheng District, a 10-minute walk from Wangfujing Subway Station (Line 1) and a 20-minute walk from the Forbidden City. The hotel offers rooms with a flat-screen TV and free WiFi. Coming with classic decor, the air-conditioned rooms are equipped with a minibar and tea/coffee maker. 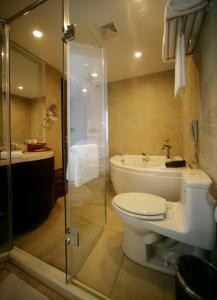 Bathrobes and slippers are provided in the en suite bathroom. 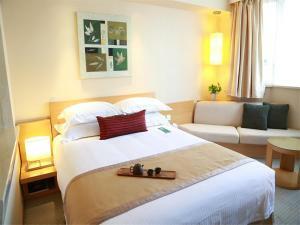 Tianan Rega Hotel is a 10-minute walk from National Museum and East Tiananmen Subway Station. Beijing South Railway Station can be reached in 30 minutes' drive while Beijing Capital International Airport lays 45 minutes' taxi ride away. 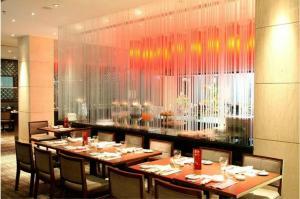 Asian and Western cuisines are served at Rega Restaurant. Refreshing beverages and light snacks are available at the lobby bar, as well as Rega Garden Bar on the rooftop. Other facilities include laundry and basic business services. For guests who wish to explore the area, ticketing and car rental services are available as well. 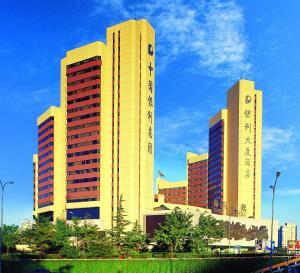 The Howard Johnson Paragon Hotel Beijing is situated in Beijing's East Chang'an Avenue, opposite and a 5-minute walk from Beijing Railway Station (also the subway station). The hotel offers 3 restaurants and free WiFi in all areas. Henderson Centre with lots of shopping and dining options is nearby. Howard Johnson Paragon Hotel Beijing is a 10-minute walk from Wangfujing and a 10-minute drive from Tiananmen Square or Forbidden City. It is a 15-minute walk from Dongdan Subway Station (Line 1 and 5) where guests can have access to Forbidden City, Beijing Silk Street and Sanlitun Bar Street. Beijing Capital International Airport is 40 minutes' drive from the hotel. 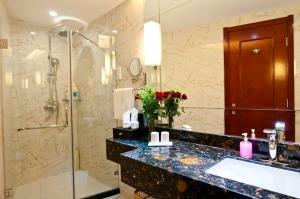 The air-conditioned rooms at Howard Johnson Beijing Paragon Hotel come with flat-screen TVs and an in-room safe. A minibar and tea/coffee maker are included. The hotel features a fully equipped gym and possible recreational service. 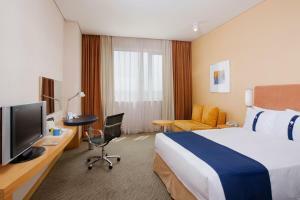 The business centre offers secretarial services, access to conference rooms and the use of the hotel's function rooms. Savour selections of Hunan and Cantonese cuisine at the Rainbow Garden Chinese Restaurant. International delights at the Sunshine Atrium café with 24 hours room service are offered. Guests may also unwind themselves with coffee, drinks and light food in the lobby lounge. No.16 Guangshun North Street Wangjing. Holiday Inn Express Beijing Huacai is favourably located in the business district of Wangjing Chaoyang, by the Wangjing Science and Technology Park and surrounded by multi-national corporations. The hotel offers multi-functional meeting rooms and a fully equipped business centre. The free internet access in the rooms is also good for both business and pleasure. Go shopping 5 minutes from Huacai Holiday Inn Express Beijing. Ask at the tour desk when planning trips and events. Play a game of golf nearby and enjoy Western food outlets within a 10-minute walk. 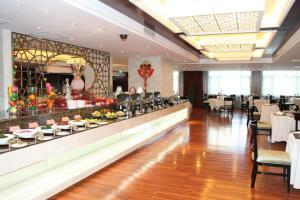 Tasty Chinese and international dishes await the guest at the Guangshun restaurant. Then reflect over a productive day of work or sightseeing with a relaxing drink at the cocktail bar. Located right next to China International Exhibition Center, Radisson BLU hotel Beijing is a 15-minute walk from Sanyuanqiao Subway Station with direct train to Beijing International Airport. The hotel offers a heated indoor pool, a lovely outdoor garden, sauna facilities and free Wi-Fi. 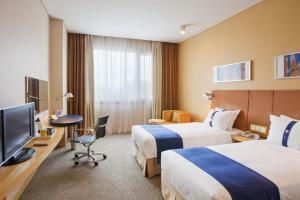 Air-conditioned guestrooms feature spacious interiors with modern furnishings. Each room is equipped with a minibar, tea/coffee making facilities and a flat-screen TV. 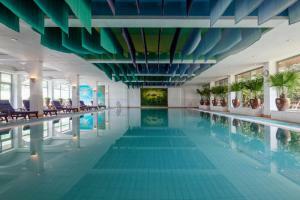 Radisson Blu Beijing provides a wealth of leisure options including leisurely swims at the indoor pool. Guests can enjoy relaxing massages or stay fit in the fully equipped fitness centre and squash courts.”Huang Du Restaurant serves a variety of Cantonese and Sichuan dishes. An international menu can be enjoyed at the Royal Cafe. Offering a great wine list, The Grill - LaxenOxen is a trendy and fine dining restaurant which built on an open flame grill concept, serving Scandinavian cuisines, prime cuts of meat and seafood. 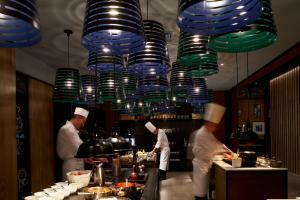 Beijing Radisson BLU is a 20-minute drive from Capital Airport and a 15-minute drive from Beijing Railway Station. Carrefour Supermarket is within a 2-minute walk. A 10-minute walk from Shangdi subway station (line 13), Holiday Inn Express Shangdi Beijing features modern rooms with free Wi-Fi. Free parking, business centre and cash machine are provided. Shangdi Holiday Inn Express is a 10-minute drive from Yuanmingyuan Park and a 15-minute drive from Summer Palace. Tiananmen Square in the city centre is a 40-minute drive away. Airport Shuttle Bus station is located just beside the hotel. All air-conditioned rooms are fitted with a cable TV, an electric kettle and a writing desk. 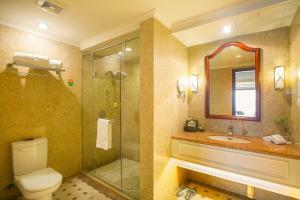 En suite bathrooms include free toiletries, hairdryers and shower facilities. 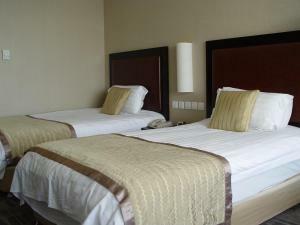 The hotel offers several meeting rooms, currency exchange and laundry services for guests’ conveniences. Safety deposit box and luggage storage are available at the 24-hour front desk. Buffet breakfast is served daily at the property. Guests can enjoy Chinese food at the hotel’s on-site restaurant. 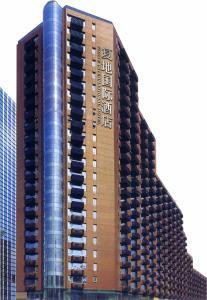 The 4-star Poly Plaza Hotel is in central Beijing, a 2-minute walk from Dongsishitiao subway station. 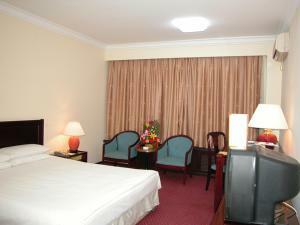 Featuring free wired internet access, the hotel has rooms with modern amenities and traditional Chinese décor. Poly Plaza Hotel is a 5-minute drive from Sanlitun Bar Street and a 15-minute drive from Tiananmen Square. Houhai is a 10-minute drive away. To rejuvenate, there are sauna facilities, an indoor pool and a fitness center. Guests can also enjoy spa treatments, rent a car to explore the city, or visit the beauty salon. Currency exchange machines, meeting facilities and a tour desk are also provided. Warmly decorated rooms have a minibar, flat-screen TV and sofa. Free toiletries, bathtub and shower facilities can be found in the bathroom. Li Gong Chinese restaurant serves Cantonese and Shanghai cuisine, and Western dishes can be enjoyed at Villa Flora Western Restaurant. Forte International Apartment Hotel is in the Chaoyang District, a 25-minute drive from Beijing Capital International Airport. Modern apartments are spacious and equipped with free Wi-Fi and cable TV. The self-catering apartments feature unique decor and have separate sitting and dining areas. Each apartment has a well-equipped kitchenette with a fridge and tea/coffee making facilities. The hotel has laundry and dry cleaning services. The 24-hour front desk can assist with ticket services and car rental arrangements. Forte International Apartment Hotel is in the middle of 3 of Beijing's commercial areas: the CBC, Lufthansa Area and Chaoyangmen Area. 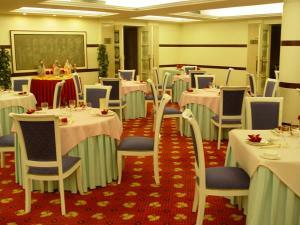 The hotel is within walking distance of a variety of restaurant serving both Western and Eastern cuisine. 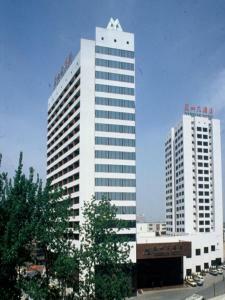 Beijing Jiangsu Plaza Hotel is located in Beijing, 0.8 miles from Yonghegong Temple and 1.6 miles from Guijie Street. Guests can enjoy the on-site bar. Free WiFi is available in all areas. A flat-screen TV with cable channels, as well as an iPad are available. Some rooms include a seating area for your convenience. You will find a kettle in the room. 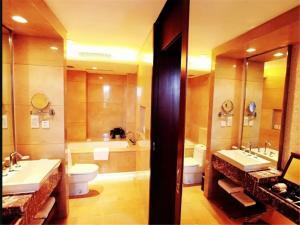 All rooms come with a private bathroom with slippers and free toiletries. You can play table tennis and billiards at this hotel, and car hire is available. Guests will also find a gift shop at the property. 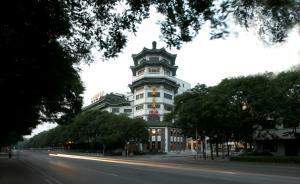 Jiangsu Plaza Hotel is a 10-minute walk from Qingnianhu Park and a 7-minute walk from Ditan Park. 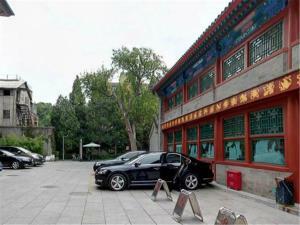 Houhai Bar Street is 1.6 miles from Beijing Jiangsu Plaza Hotel, while Beijing Hutong is 1.6 miles from the property. Occupying a central location in Beijing’s business district, pentahotel Beijing is a 2-minute walk from the 2 subway lines at Chongwenmen Metro Station. It features a business centre. Both free wired internet access and free Wi-Fi are provided in the entire property. Located beside New World Shopping Mall, Beijing pentahotel is about a 10-minute drive from Tiananmen Square and popular shopping areas like Wangfujing Pedestrian Street. Beijing International Airport is a 35-minute drive away. Air-conditioned rooms offer the comfort of over-sized windows, a sofa and carpeted floors. Decorated in neutral shades, they have a 37-inch flat-screen TV and a safe. Guests can work out at the gym. 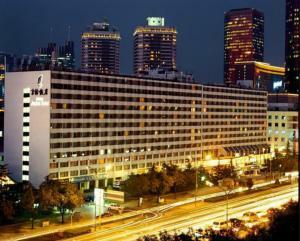 Offering 24-hour reception, pentahotel also provides tour and ticketing services. Bicycle rentals are available for guests to explore around the city. Western and Chinese dishes can be sampled at the café while the Lobby Lounge provides a cosy environment for light snacks and cocktails. Noodles are served at the Noodle Bar. Boasting a spa and wellness centre, an indoor pool and gourmet cuisine across 4 stylish restaurants, Jing Lun Hotel is ideally located a 3-minute stroll from International Trade Centre. Free Wi-Fi is provided in the entire property. 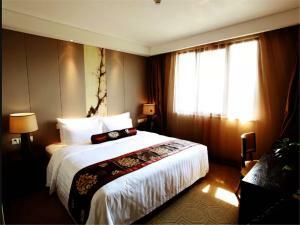 Jing Lun Hotel is a 10-minute drive from Silk Market, Beijing Railway Station and Tian’anmen Square. Yong'anli Subway Station is 400 yards away. Capital International Airport is a 30-minute car journey away. Beijing South Railway Station can be reached in 50 minutes' drive. Tastefully decorated, the elegant guestrooms feature warm lighting and modern interiors. Each well-appointed unit is fitted with wired internet access, a flat-screen satellite TV, coffee machine and safety deposit box. Bathrobes and free toiletries are stocked in the attached bathrooms. Guests can stay fit with a workout in the fitness centre, relax in the hot tub, organise day trips at tour desk, or rent a car to explore the surroundings. Laundry and ironing services are available. Tao Li Chinese restaurant serves a fine selection of local dishes, while Japanese flavours are available at Maya Tapanyaki. Chinese snacks and coffee can be found at Si He Xuan and Tai Fei Garden. Crowne Plaza Beijing International Airport offers rooms with 37-inch flat-screen TVs, 4.2 miles from Beijing Capital International Airport. Free scheduled airport shuttle bus is provided. Offering free parking, it provides access to a fitness centre and indoor pool. Crowne Plaza Beijing International Airport is situated opposite the New China International Exhibition Centre and Beijing Airport Industrial Park. China International Exhibition Centre Station (Line15) is just besides the hotel. It is a 30-minute drive from the city centre. Boasting views from floor-to-ceiling windows, air-conditioned rooms here feature warm wood furnishings and ample work space. 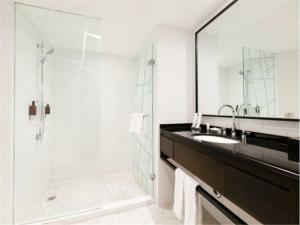 Premium amenities include a safe, ironing facilities and a bathtub. Relax with soothing massages at Crowne Plaza Beijing International Airport’s spa or with the steam baths available. Staff can assist with travel arrangements and business needs. Enjoy buffet breakfast spreads with international dishes at Crowne Cafe. Other dining options include Chinese specialities at Jing Tai Palace and Yozakura Japanese restaurant. Full of natural light, Lobby Lounge serves a wide-range of refreshing drinks and great tasting snacks for guests. Situated in the 2008 Olympic village of Chaoyang District, Ya'ao International Hotel Beijing is a 20-minute drive from the Beijing National Stadium and Beijing’s bustling city centre. Free Wi-Fi is available in some rooms. Furnished with modern decor, all rooms at Ya'ao International Hotel Beijing are well equipped with a tea/coffee maker and a minibar. Satellite TV with a selection of Pay-per view movies, an iron and a safety deposit box are available. The hotel also provides bathrobes and slippers. Ya'ao International Hotel Beijing has an in-house beauty salon to attend to guests’ beauty needs. Guests can also work out at the fitness centre. Extras include a business centre, translation and ticketing services to facilitate guests' trip. Dry cleaning, laundry and currency exchange services are available as well. International dishes and cocktails are served in the hotel’s western-style restaurant. 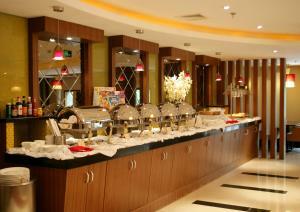 Guests can also enjoy Best Western OL Stadium’s excellent barbecue facilities. 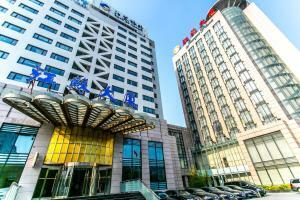 Best Western OL Stadium is conveniently situated 25 minutes from Beijing Capital Airport and 5 minutes from the Chinese Silicon Valley, Zhongguancun Hi-Tech District by car. The famed Bird's Nest, China International Stadium is a 10-minute drive away, so is the Water Cube, Beijing National Aquatics Centre. Situated in Bejing city centre, Hejing Fu Binguan offers free WiFi in all areas. Guests can enjoy the on-site restaurant. Free private parking is available on site. Hejing Fu Binguan is 1,000 yards from Nan Luo Gu Xiang and 0.7 miles from Beijing Hutong. Zhangzizhong Road subway station is a 5-minute walk away. Tiananmen Square is a 20-minute drive away. Each room at this hotel is air conditioned and is fitted with a flat-screen TV with cable channels. You will find a kettle in the room. Extras include slippers, free toiletries and a hairdryer. There is a 24-hour front desk at the property. The hotel also offers car hire. 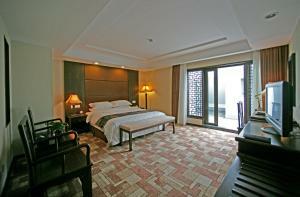 A 5-minute walk from Renmin University, Beijing Yanshan Hotel features air-conditioned rooms with free wired internet. Free Wi-Fi is provided in the public areas. For relaxation, there is a sauna and massage services, as well as free bike rentals. All the non-smoking rooms include a TV and a private bathroom, some with a shower and some with a bathtub. A flat-screen TV, minibar and personal safe are also available in some rooms. Suites include a separate living room. Beijing Yanshan Hotel is a 10-minute walk from Peking University and Kinghua University, and the Summer Palace is a 10-minute drive away. It is a 30-minute drive from both Beijing Train Station and Tiananmen Square. Beijing Capital International Airport is a 40-minute drive from the hotel. 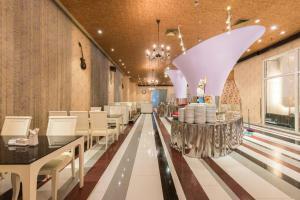 Yanyunxuan Restaurant serves Chinese dishes, and Yajing Restaurant features Western food and buffet spreads. Guests can exercise at the fitness center, or use the hotel's business center. 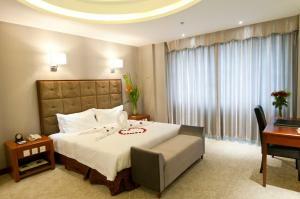 The hotel also provides laundry services and a 24-hour front desk. 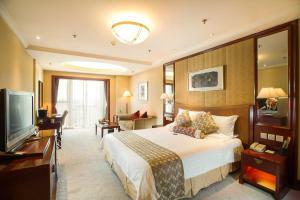 Gehua New Century Hotel Beijing is a luxurious hotel located an 8-minute drive from Guloudajie Subway Station. It offers an indoor pool, a spa and free internet in rooms. 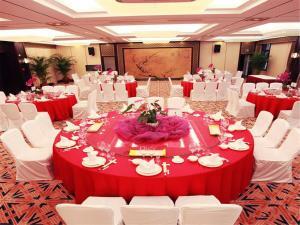 Within 10 minutes' drive, you may access China National Convention Center. 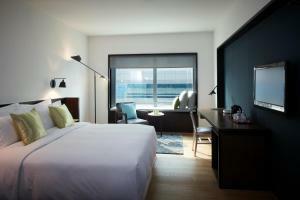 Air-conditioned guestrooms feature modern interiors with large windows. Each room is equipped with a minibar, tea/coffee making facilities and a flat-screen TV with satellite channels. Guests can work out at the fitness centre or enjoy massages at the spa. The hotel has a beauty salon and sauna facilities on site. Other recreational facilities include private KTV rooms. 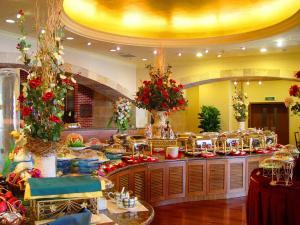 Buffet spreads are served at Café One, while Jiang Nan offers Chinese dishes. Other dining options include Azzurro Italian and I MA RI MA Japanese Restaurant. Square Deli and Tea of Spring offer light refreshments. Hotel New Century Gehua is a 5-minute drive from Beijing National Stadium and a 30-minute drive from Beijing Railway Station. Capital Airport is a 40-minute drive away, and free parking is provided. Beijing South Railway Station lays 1 hour's drive away while Beijing West Railway Station is positioned 35 minutes' drive away.